Sometimes at night, scientists stare out at the vast universe, and they wonder what’s out there. They wonder if it’s wondering about us. They wonder if whatever's out there is, at that very moment, looking down and marveling at the Great Wall of China or the glimmering lights of our magnificent cities. Or the giant faces of our fast-food mascots. 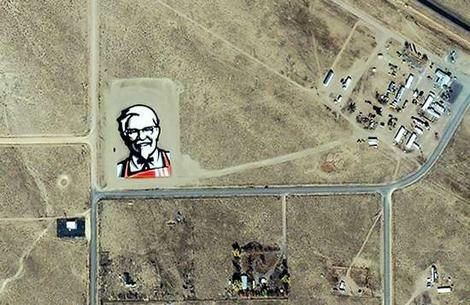 After many months of secrecy and hiding enormous tiles behind its back whenever anyone walked in the room, KFC revealed an 87,500-square-foot smiling mug of Colonel Sanders yesterday, installed in the Nevada desert near Area 51 (of course). 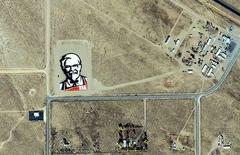 The icon has earned KFC the distinction of being the world’s first brand to be visible from space, made possible by some 50 designers, architects, engineers and astrophysicists who surprisingly didn’t have more pressing tasks to attend to. Making planet Earth fat just wasn't enough...was it. Woah! Is that true? I guess they really like it.